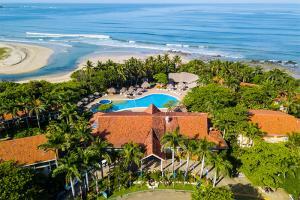 Occidental Tamarindo is the only all-inclusive resort on stunning Playa Langosta. Surrounded by lush gardens and tropical landscapes, the resorts features 198 rooms with an array of services including two restaurants, two bars, a swimming pool, beach volleyball, kayaking, snorkeling, spa and more. It’s ideal for families, surfers and nature lovers with its stunning views of the beach and beautiful sunsets. Enhance your stay with Premium Level services offering private check-in, premium liquor, and more. 50 minutes from the nearest national airport. A little over one mile from Tamarindo downtown. Playa Langosta. Dining options include a buffet restaurant, an a la carte restaurant, and poolside and lobby bars. Santa Cruz, Guaitil, Guanacaste National Park, Barra Honda National Park.